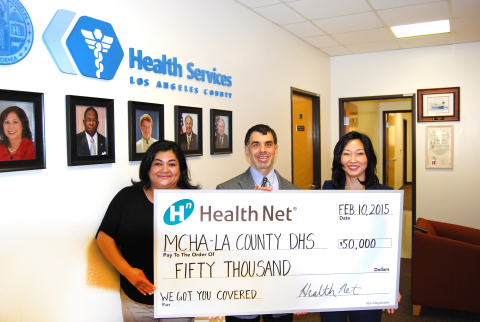 LOS ANGELES--(BUSINESS WIRE)--Health Net, Inc. has provided a $50,000 charitable grant to Maternal and Child Health Access (MCHA) that will help it – in collaboration with the Los Angeles County Department of Health Services – train those who enroll Los Angeles County residents and their family members in Medi-Cal, Covered California, or the county’s no-cost health care services program, My Health LA. “Health Net is committed to helping organizations that serve low-income individuals residing in Los Angeles County,” said Patricia Clarey, Health Net’s state health plan and regulatory relations officer. Health Net, Inc. (NYSE:HNT) is a publicly traded managed care organization that delivers managed health care services through health plans and government-sponsored managed care plans. Its mission is to help people be healthy, secure and comfortable. Health Net provides and administers health benefits to approximately 6.0 million individuals across the country through group, individual, Medicare (including the Medicare prescription drug benefit commonly referred to as “Part D”), Medicaid, U.S. Department of Defense, including TRICARE, and Veterans Affairs programs. Health Net also offers behavioral health, substance abuse and employee assistance programs, managed health care products related to prescription drugs, managed health care product coordination for multi-region employers, and administrative services for medical groups and self-funded benefits programs. This release contains references and links to other websites that may contain content that is not owned or controlled by Health Net. Please be aware that references or links to other websites are provided for the user’s convenience and that Health Net is not responsible for any such content that is not owned or controlled by Health Net. Health Net does not express an opinion on any such content and disclaims any liability in connection therewith. Health Net, Inc. provides $50,000 charitable grant to help train those who enroll Los Angeles County residents and their family members in Medi-Cal, Covered California or My Health L.A.